When will be Alan Carr's Happy Hour next episode air date? Is Alan Carr's Happy Hour renewed or cancelled? Where to countdown Alan Carr's Happy Hour air dates? Is Alan Carr's Happy Hour worth watching? Alan Carr throws open the doors to a brand new series where celebrity guests, stand-up comedy, variety acts and live music are all on the bill. Filmed at a social club in front of a specially invited audience, Happy Hour is Alan's own club night packed full of big laughs, amazing audience surprises and exclusive performances. Guests are Rebel Wilson, Jack Whitehall, Rob Beckett, Bastille and James Arthur. Alan Carr throws open the doors to a brand new series where celebrity guests, stand-up comedy, variety acts and live music are all on the bill. Filmed at a social club in front of a specially invited audience, Happy Hour is Alan's own club night packed with big laughs, amazing audience surprises and exclusive performances. Guests include Sarah Millican, Olly Murs, Craig David and Lady Gaga. Alan Carr throws open the doors to a brand new series where celebrity guests, stand-up comedy, variety acts and live music are all on the bill. Filmed at a social club in front of a specially invited audience, Happy Hour is Alan's own club night packed full of big laughs, amazing audience surprises and exclusive performances. Guests include Michelle Keegan, John Legend, Louisa Johnson, Robbie Williams and Jamie Oliver. 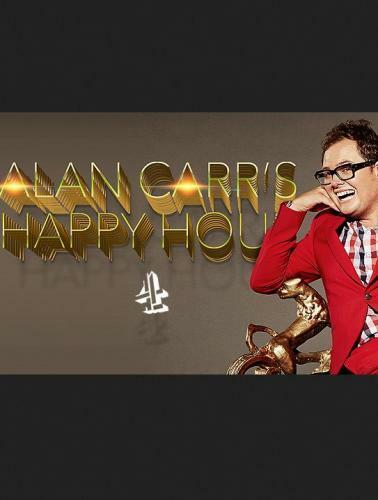 Alan Carr's Happy Hour next episode air date provides TVMaze for you. EpisoDate.com is your TV show guide to Countdown Alan Carr's Happy Hour Episode Air Dates and to stay in touch with Alan Carr's Happy Hour next episode Air Date and your others favorite TV Shows. Add the shows you like to a "Watchlist" and let the site take it from there.